How taste can change. I didn’t use to like cauliflower. But then cauliflower seemed to pop up all over the place – in one interesting recipe after another. Now I am hooked. 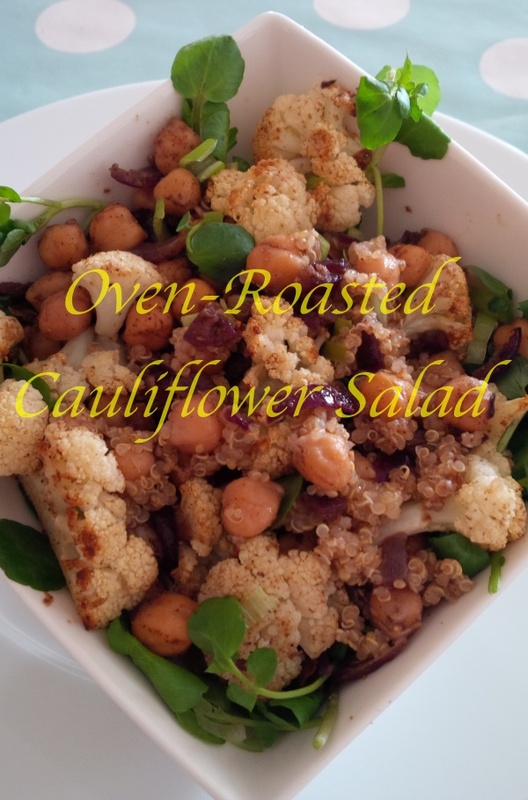 Inspired by a recipe by British chef Stevie Parle, I recently made this oven-roasted cauliflower salad with chickpeas and quinoa. It is all in the cooking as far as I am concerned. I still don’t like plain boiled cauliflower but I do love Cauliflower Rice With Lime And Coriander/Cilantro. Cauliflower is part of the super-healthy cruciferous family – broccoli, cabbage, Brussels sprouts, kale and cress are some of the other members. These vegetables are rich in vitamins, minerals and fibre and also contain powerful phytochemicals which can help to reduce the risk for cancer. I am using healthy and tasty coconut oil in this recipe but you can replace it with olive oil. 1. Preheat the oven to 200C/fan 180C/400F/gas mark 6. In a roasting pan, toss together the cauliflower pieces, ground coriander (cilantro) and coconut oil. Season with some salt and pepper and place the roasting pan in the oven for 30 minutes. 2. Rinse the quinoa under cold water, drain and then place in a pot with 400ml, 13½floz, 1.6 cups water. Cover the pot with a lid. Bring to a boil, then lower the heat and simmer for 15 minutes, until the water has been absorbed. 3. While the quinoa is cooking, place 2 tablespoons of coconut oil in frying pan over a low heat. Add the chopped onions and fry for about 5 minutes. Add the crushed garlic and fry for a further minute before adding the cumin, allspice and chilli flakes. Fry for one more minute. 4. Season the onion mixture with some salt and pepper and add the cooked chickpeas to the frying pan. As soon as the chickpeas are heated through, take the pan off the heat. Add the quinoa and roasted cauliflower to the pan and mix together. 5. Divide the watercress or spinach between four bowls or plates and top with the cauliflower mixture. You could also add some crumbled feta cheese to each portion, and/or some pumpkin seeds.